One of my favourite types of engagement sessions has always been at the beach. But this beach engagement session was a little different. 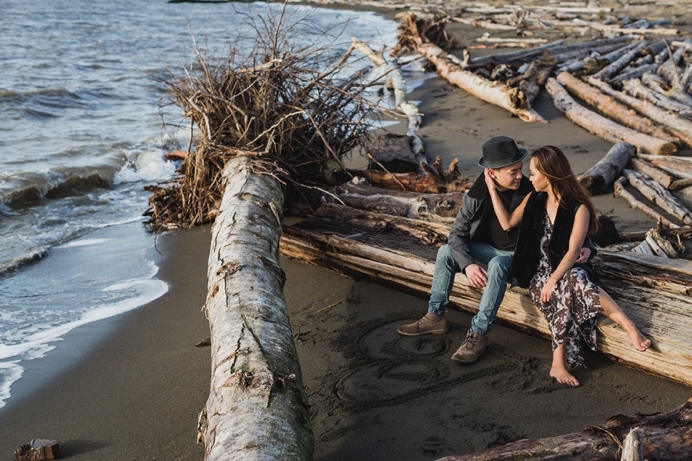 I usually shoot beach engagement sessions during the warmer months, but this one was in the middle of winter, and shortly after Donna at returned to Vancouver from her trip to the Philippines, where temperatures were far far warmer than what we get here in the Canadian West Coast. Donna + Gab are a beautiful couple. They’re the kind of couple you can spend hours photographing with little effort. But I have to tip my hat to Donna especially, because she really toughed it out for this particular engagement session- where the frigid winter weather would have made just about anyone else change their minds, Donna withstood the cold and did an amazing job with their beau (and soon to be husband) in front of the camera. Outdoor photography can be tough in the winter, so I was really humbled by Donna and Gab. Despite the frosty cold weather, they made their winter beach engagement session warm and fun. We are really looking forward to seeing Donna and Gab soon at their wedding this year in Vancouver. Thank you for the incredible engagement session, you are both amazing!